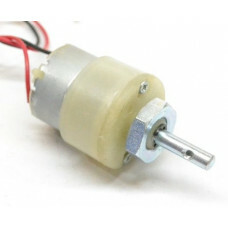 3.5 RPM 12V DC geared motors widely use for robotics applications. Very easy to use and available in standard size. Also, you don’t have to spend a lot of money to control motors with an Arduino or compatible board. The most popular L298N H-bridge module with onboard voltage regulator motor driver can be used with this motor that has a voltage of between 5 and 35V DC or you can choose the most precise motor diver module from the wide range available in our Motor divers category as per your specific requirements.